The boy who would one day be Rodney Dangerfield started selling one-liners to comedians at age 15, and was doing stand-up at 17 as "Jack Roy". He performed comedy for ten years with little success, always holding down a day job to pay the bills. In 1951, he quit comedy in disgust and sold aluminum siding for 12 years before stepping on stage again. Afraid of bombing, he didn't want either of his names connected with the expected bad reviews, so at his first "comeback" gig, he asked the club manager to make up a name for him. "Any name at all, just don't put my name in the ad." 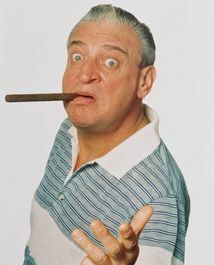 Thus Rodney Dangerfield was born. A guest spot on The Ed Sullivan Show led to dozens of appearances on Johnny Carson's Tonight Show. Dangerfield's nightclub, cleverly called Dangerfield's, was quickly successful, and gave Dangerfield steady work. His schtick was the perpetual loser, but Dangerfield didn't coin his most famous line -- "I don't get no respect" -- until 1972, when The Godfather, with its overtly serious theme of "respect", needed deflating. Caddyshack (1980) made him a movie star, and his comedy album, No Respect, won a Grammy in 1981. He was the voice (and author and producer) of Rover Dangerfield (1991), and he played Juliette Lewis's incestuous father in Natural Born Killers (1994). In late August of 2004, Dangerfield checked into a hospital for heart valve replacement surgery, and cracked one last joke when reporters asked about the operation. "If things go right, I'll be there about a week, and if things don't go right, I'll be there about an hour and a half." During the surgery, he fell into a coma. He briefly regained consciousness in early October, kissing his wife and smiling for the doctors. Dangerfield slipped back into a coma, dying several days later. His tombstone is engraved, "There goes the neighborhood". UCLA Medical Center, Los Angeles, CA.